Consultation is a key part of HealthPathways development process where health professionals and service providers from across our state are invited to consult on draft pathways prior to publication. While feedback via the HealthPathways portal is encouraged and can be easily provided at anytime, the consultation process provides an opportunity for review and feedback during the localisation process prior to the pathway going live. Consultation runs for 14 calendar days, and participation is by invitation. Participants receive an email indicating consultation is open for a specific pathway along with a link and login details to access the draft pathway. Feedback on the specific clinical pathway and related service information can be easily provided via Send Feedback icon on the draft pathway. 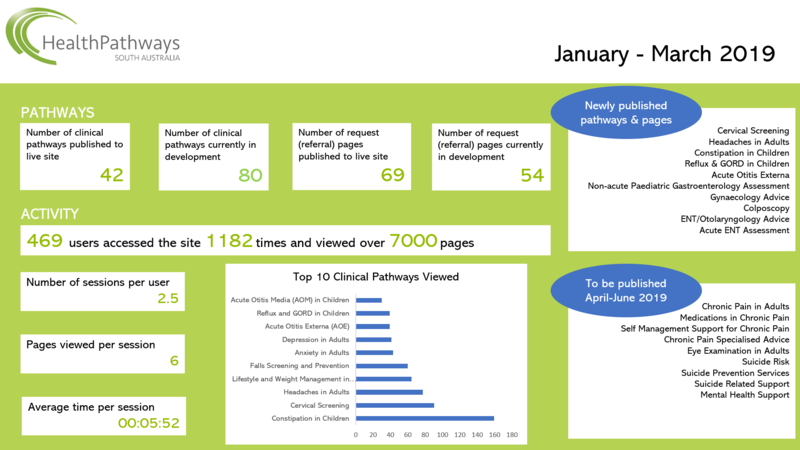 All feedback received is reviewed by the GP Clinical Editor and supports the HealthPathways Team with finalising the draft for publication to the live HealthPathways SA portal. All current work in progress is listed on the Pathway Progress page. Register your interest for being involved in consultation on any of the pathways currently coming up for consultation or future consultations by emailing the HealthPathways Team indicating the pathway/s or clinical area of interest.